Appply is a professional business WordPress theme with bold and spacious design to showcase your content. You can build an online store, business website or a simple blog using Appply theme. This theme has a large Featured Slider on the Homepage powered by the fully responsive FlexSlider, which makes it suitable on mobile devices. Appply theme is integrated with Features and Testimonials widget from Woo themes to easily add features and testimonial sections to home page. 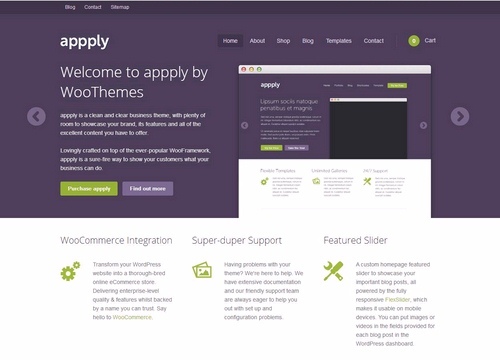 Appply theme comes with full support for Woo Commerce plugin. Comes with 6 pre-made color schemes and easy to customize options panel. Planning to buy Appply theme from Woo Themes. Buy with Confidence. This page provides you with all possible Buying options. Usually Buying options or Pricing page of any theme designer is designed for conversions (to attract users and convince them to buy). Our Buying options page is not like that. We provide all the information about each Buying option. No hidden text or terms. We tried to cover everything that you should know before buying this theme.